Oregon faces a severe fiscal crisis. In short, the state is just not taking in enough money to fund all the services needed by people. In response the 2009 Legislature passed two measures (66 and 67) that will raise $733 million in new revenue in the 2009-11 biennium. While not a solution to the crisis, this extra money will help reduce cuts in spending on education, health and public safety. These measures also help produce a more equitable tax structure. In brief, Measure 66 raises taxes on high income Oregonians—couples earning over $250,000 a year and individuals earning over $125,000 a year. Measure 67 raises taxes on profitable corporations. (More details on both measures here). Perhaps not surprisingly, there are those that oppose any tax changes, even ones as important, needed, and justifiable as these. They succeeded in putting these measures on the January ballot, hoping to get voters to reject them. Today, low-income Oregonians pay a larger share of their income in state and local taxes than wealthy Oregonians. In fact, the highest-income Oregonians pay the lowest share of their income in state and local taxes. . . . After accounting for the deduction of state income taxes on federal tax returns, the lowest-income Oregonians currently pay 8.7 percent of their income in taxes, the highest share among all income groups. Middle-income Oregonians pay 7.9 percent. The wealthiest 1 percent — households with income in excess of $410,000 and averaging over $1 million — pay only 6.1 percent of their income toward state and local taxes. The lowest-income Oregonians will still pay the same 8.7 percent of their income in state and local taxes, but the share will increase for those at the highest levels of the income scale. For the wealthiest 1 percent, for example, state and local taxes will increase from 6.1 to 6.6 percent of their income. For the next highest 4 percent of taxpayers, taxes will increase from 7.0 to 7.1 percent of income. These slight changes for those at the top 5 percent of the income scale constitute a small but important step toward making our tax system better based on ability to pay. As Chuck Sheketoff at the Oregon Center for Public Policy noted, these riffs are necessary because only 3 percent of Oregonians will pay higher taxes if Measures 66 and 67 pass. . . .
Tis the season. I’ll end with this. The OAJKT website insists that “the most damaging” tax increase for business would require that a C-corporation with $25 million-$50 million in Oregon sales will now pay a gross sales tax of $30,000. That’s all? Less than one-tenth of 1 percent? For many companies that, for years, have paid the $10 minimum? Who in the world considers that unreasonable? A number of economists teaching and working in Oregon have recently published a statement in defense of Measures 66 and 67. You can read it here. The launch of “B’eau-Pal” water came as Bhopal prepares to mark the 25th anniversary of the Bhopal catastrophe, and coincides with the release of an official report by the Sambhavna Trust showing that local groundwater, vegetables, and breast milk are contaminated by toxic quantities of nickel, chromium, mercury, lead, and volatile organic compounds. The report describes how a majority of children in one nearby community are born with serious medical problems traceable to the contamination. The bottle looks beautiful. It sports an old-fashioned spring-top stopper. The red, diamond-shaped label features an elegant font. From a distance, the silhouetted landscape on the label looks exotic. It is, like all fine gourmet water, “bottled at source.” Even the French name of the water suggests elegance: B’eau Pal. But wait: B’eau Pal? That sounds rather familiar. You look at the label more carefully. The top of the label reads: “25 years of pollution.” The picture on the label isn’t an exotic location after all. It’s…the Union Carbide plant in Bhopal, India that poisoned a half a million people and killed thousands back in 1984 when it accidentally released tons of methyl isocyanate. B’eau Pal is the work of the Yes Men, the dynamic duo of disinformation. Five years ago, one of the pair, Andy Bichlbaum, appeared on BBC as a spokesman for Dow Chemical, which now owns Union Carbide, to announce that his company would provide $12 billion in medical care for the 120,000 victims of the Bhopal calamity and fully clean up the site. Dow lost $2 billion in market value in 20 minutes. That’s how long it took before the hoax was exposed. The Yes Men’s point: The heads of major corporations won’t suddenly do the right thing even if someone – somehow, somewhere, some day – manages to reveal to them the errors of their ways. Now five years later, Dow blathers on about the importance of clean water even as it does nothing for the residents of Bhopal, who are suffering from a drought. To catch the attention of all those who have forgotten about Bhopal – virtually everyone except the people of Bhopal and a handful of dedicated activists – the Yes Men created B’eau Pal, a critique wrapped in a jest and shrouded in faux-corporate hype. Discussions of health care always seem to involve cost calculations that suggest we really cannot afford meaningful change. Yet somehow our national obsession with the cost of health care reform never extends to spending on the military or a discussion of the trade offs between spending on health care and the military. Want to get a quick look at our ever escalating military spending—check out the cost of war web site. The US now accounts for between 42 and 48 percent of total global arms spending (depending on definitions and sources). Here are the top ten spenders as of 2008 (in billions of dollars) according to the Stockholm International Peace Research Institute. The growing militarization of our budget is strangling all other priorities. For example, between 2001 and 2008, the federal budget grew by 28%. Over that same period, grant funding for state and local governments (which are now in crisis and slashing spending) rose by only 14% while spending on the military grew by 41%. And this calculation is based on a very conservative definition of military spending—it does not include spending on veterans’ health care needs or interest payments due to past military generated budget deficits. The Supplemental Appropriations Act of 2009, signed into law by President Obama on June 24, 2009, added $45.5 billion in spending for the war in Iraq and $39.4 billion in spending for the war in Afghanistan—for a 2009 fiscal year total of $84.8 billion. This brought total war-related spending for Iraq to $687 billion and for Afghanistan to $228 billion–a total war cost of $915.1 billion. We are talking real money here–enough to finance real social change. And again these numbers do not capture the full extent of our spending on the military. We have to turn the spotlight on our foreign policy and fully engage the debate over what defines our national interest. The 2007–2009 recession has been an employment disaster. In the twenty months from December 2007 (the start of the recession) to August 2009, we have lost more than 7.0 million private-sector jobs. What makes this even more serious (suggesting deep structural problems) is that this recession follows an economic expansion (November 2001–December 2007) that was one of the weakest in terms of private sector job creation; annual average private sector employment grew by approximately 1 million jobs a year. By comparison, annual average private sector employment grew by 2.4 million jobs a year during the 1982-1990 expansion and by 2.2 million a year during the 1991-2001 expansion. While the media and the government talk about economic recovery because the stock market and profits are up—the employment crisis continues and can be expected to continue for years. And of course these statistics do not take into account the worsening of employment conditions (including the growing number of part-time and temporary positions, intensity of work, and employment insecurity). Real recovery is going to require real structural change and so far that remains off the mainstream political agenda. At one time economists argued that our shift to a service oriented economy would encourage employment stability. The argument was that since firms could not build up a big inventory of services (like they could with parts and components), private sector service employment could be expected to be relatively recession proof. Well that seems to be changing. 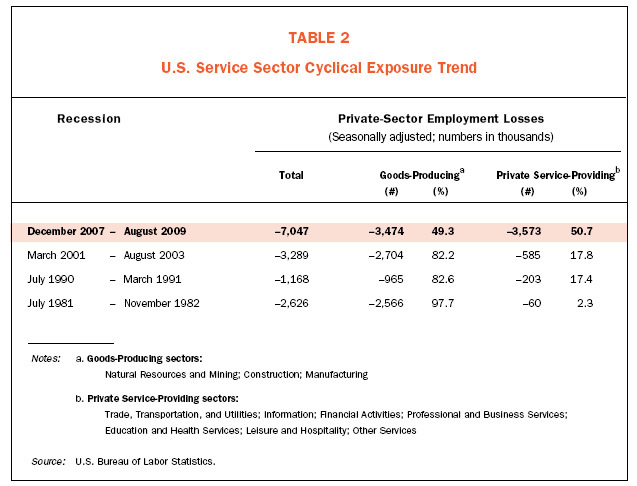 The table below shows “the total private-sector employment loss in each of the last four recessions, the decline in jobs in the goods-producing and in the private service-providing sectors, and the share of each in the total loss.” In contrast to past recessions, service sector employment has taken a big hit this recession; in fact this sector accounts for more than fifty percent of total private sector job losses. It may seem puzzling—the stock market and profits are recovering while living and working conditions for the majority continue to decline. Well, it is not so puzzling. In fact, worker losses are an important reason (along with government bailouts) for capitalist gains. Yes, it is that kind of world. The signs [for corporate earnings] look good, and last month’s employment data are part of the reason. Through the third quarter, businesses continued to slash labor costs at rates not usually seen even in past severe recessions. In fact, for the past six quarters, companies have cut employees’ overall hours worked by far more than they have pared output. The result: a striking 2.8% annual rate of growth in productivity, a rare pace during a recession. Productivity gains averaged only 0.8% annually during the previous nine downturns. . . . The September payroll numbers showed that overall hours worked in the third quarter fell at a 3% annual rate from the second quarter. If economists are correct in expecting about 3% growth in real gross domestic product for the quarter, then productivity may well post its second consecutive quarterly advance of about 6%. That would mean unit labor costs, or pay adjusted for productivity, are set to plunge for the third quarter in a row. In fact, unit labor costs, which are a key factor in determining profit margins, appear to have posted the largest three-quarter decline since quarterly data began in 1947 [see chart below]. Said differently, businesses have been able to boost profits in the face of poor demand conditions by slashing labor costs. The profit rise was weak in the first and second quarters of this year because sales actually fell in both quarters. The third quarter (July-September) was different. Overall demand rose (thanks in large part to the stimulus) while labor costs continued to fall (which means fewer people worked harder for less). The result: significant gains for business and a stock market rally. One wonders if they have a different long term plan? And if not, whether workers do? Below are two charts that come from the Federal Reserve Bank of Minneapolis–they help put the current recession in historical perspective. Of course–this recession has not yet been officially declared over.